Small (6 - 12 mos) - $40.99 Medium (18 - 24 mos) - $40.99 Only 3 left! Large (2T - 4T) - $40.99 X-Large (4 - 6) - $40.99 Only 1 left! Owning your own dinosaur is a lot of hard work...and we’re pretty sure it might be illegal; we're not quite sure on all of the details of the actual laws for that just yet. But it’s safe to assume you’d be breaking at least ten different laws. Just imagine how much extra effort it would take to search all the grocery stores in your area just to find and match its very specific prehistoric diet. That’s like next level paleo diet. Trust us, it would be fun for, like, two days. Then you’d look at your baby brontosaurus or your tiny pterodactyl and think: what have I done? 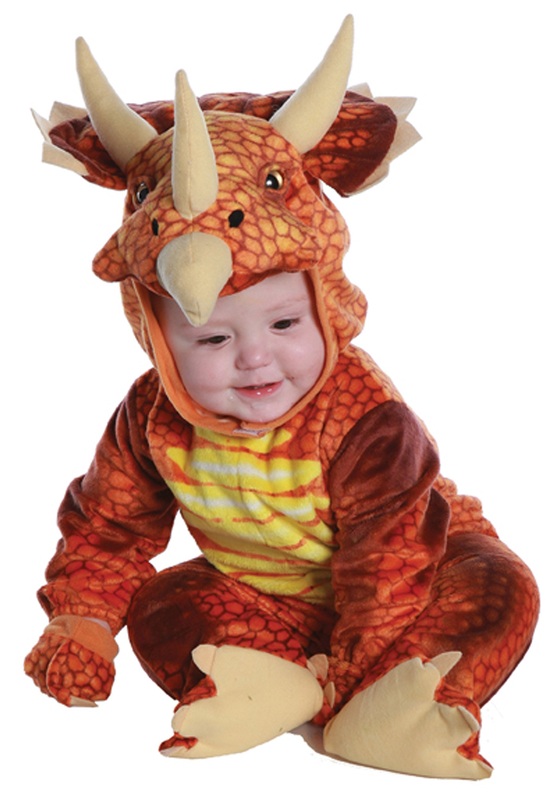 Turning your little one into a triceratops, however, is much easier and totally within the realm of legality. So, the next time you start doing online research on exotic prehistoric pets, just remember that we have this adorable Rust Triceratops Costume just waiting for your munchkin. At the end of the day, you’ll be happy the look--while insanely adorable--is temporary. Not only does this cozy romper promise to keep your kiddo cuddly, but the plush, horned headpiece and matching mittens mean that you may, in fact, really convince yourself that you’ve got a pet dinosaur on your hands. But rest assured: you already know where to find his favorite food--mashed bananas--and he’ll likely not outgrow the entire floor plan of your house.